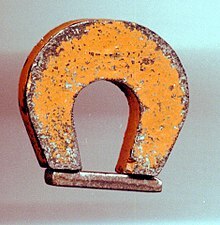 Permanent magnets (materials that can be magnetized by an external magnetic field and remain magnetized after the external field is removed) are either ferromagnetic or ferrimagnetic, as are the materials that are noticeably attracted to them. Only a few substances are ferromagnetic. The common ones are iron, cobalt, nickel and most of their alloys, and some compounds of rare earth metals.